I cofounded Yogasara in 2008, because of a passion to offer Yoga to empower people within our community. 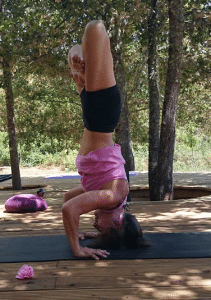 I am a senior teacher and a Yoga Elder with the IYN Independent Yoga Network. I have developed Yogasara’s contribution to the modern yoga world through the method used in our teacher trainings; Yogasara Krama Vinyasa Tantra. Find out more HERE. Yoga has been a way of life for me for many years and it is a privilege to share this experience and celebrate the benefits with people from all walks of life. I believe every human being has the potential to realise their innate radiance, power and creativity. Yoga practice can open you to experience this potency and enable you to access the abundant life force that can facilitate transformation and healing. I teach Vinyasa flow, a breath led, creative expression of the human spirit through the body. Intelligent alignment accessed from the inside out, my classes are challenging and supportive, upbeat and nourishing, I want you leave feeling uplifted, centred and present. You will get stronger and find fluidity in your body, mind and emotions, you may also sweat! I also teach therapeutic classes, courses, one-one sessions, workshops, retreats, yoga for wild women, immersions and teacher trainings. My offering is a synergy of the wonderful teaching I have received and the wisdom I have discovered from my own practice/studies including Ashtanga, Anusara, Forrest, Kundalini, Tantra, Mantra and Meditation. I was introduced to Meditation in the style of Krishnamurti in my teens. After a near death experience (NDE) when I was 22, I’d say Yoga found me. I tried out many classes and other healing arts seeking to make sense of my NDE. I fell in love with yoga when I found a class where the essence of yoga was tangible in the room – a warm, blissful, loving feeling and I felt like I’d come home. That class was taught by my now dear friend Fran Thompson. I have attended several teacher trainings which include Chi Yoga School – a great blend of Ashtanga and seasonal flow yoga incorporating NLP, Astrology and the wisdom of the Chinese five elements system, Anusara Immersions and Forrest Advanced Teacher Training. I have also attended hundreds of classes over the years and many other workshops, too many to mention all of them. Teachers I have been blessed to train with include Ashtanga – Pattabhi Jois, David Svenson, Brian Cooper and Richard Freeman. Other significant teachers I have and still hang out with are Bridget Woods Kramer and Clive Sheridan, along with my Movement Medicine teachers Yaacov and Susannah Darling-Khan. Alongside Yoga I have always danced and see ‘free’ movement as the ideal compliment to the Yogasana, Mantra, Meditation and Tantra combination that is the Yogasara method. I have completed a two year Apprenticeship program with the School of Movement Medicine whom I have been dancing with for 20 years and am currently undergoing their professional training. www.schoolofmovementmedicine.com. I am also an Embodied Psychotherapist and a member of the BACP (British association of Counselling and psychotherapy). I completed an Integrative training alongside a diploma in Drama therapy, ongoing training in Family Constellations and embodied therapy. I am currently in the process of writing an Embodied Yoga Therapy Diploma training course which Yogasara will offer in September 2020. I work from the premise that the mind-body-emotions and spirit are interactive aspects of being. Finding our way in could be through the body e.g. asana or bodywork – I incorporate my bodywork training in Structural Integration when appropriate. Or the way in could be through more directly examining the mind and emotions through talking – addressing our conscious and unconscious stories/beliefs. Either way, I have found that freedom, healing and greater love comes through the re-writing of our story in our heads, hearts and bodies. I take a creative and curious approach to working out together the most effective way to do this. I offer a loving, supportive, well held relationship for you to explore what you need to flourish in all areas of your life. I have regular professional supervision to support me to offer you the strongest container I can for your wellbeing. I am also a Registered nurse and do occasional shifts working at the BRI and HM Prison Horfield. I previously specialised as a Nutrition and Complimentary therapies Link Nurse and as a Drugs and Alcohol Nurse.